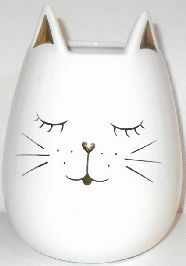 Here is a beautiful ceramic cat face vase. The white vase is detailed with gold highlights. The cat's nose is a gold heart. The vase is 4 7/8" across the base. It is 6 1/2" high (to the tip of the cat ears) x 4 1/2" deep. Paper sticker from Pier 1 still on the base (sticker says exclusively for Pier 1 Imports) . Previously owned but in new condition.